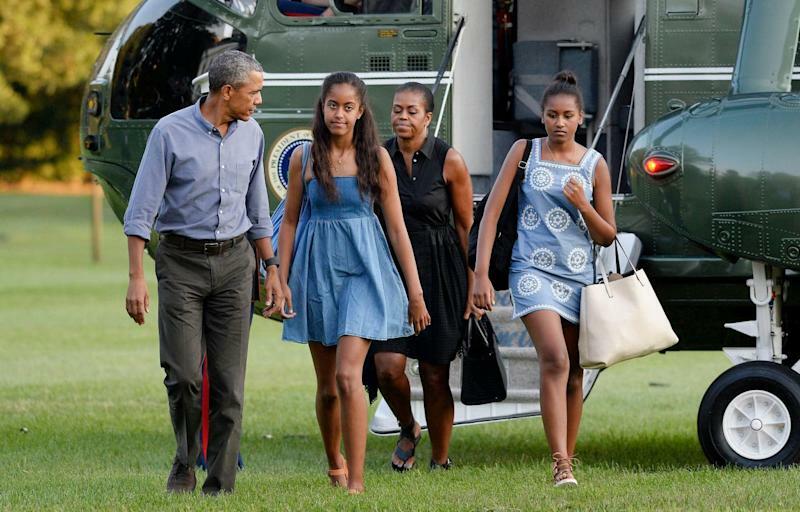 The Obama family returning home from vacation. Sasha and Malia Obama might live in a big white house, be trailed by secret service, and have a parent who knows the nuclear codes, but they’re still just normal teenagers. On a recent summer escape from Washington, DC, the First Family vacationed in Martha’s Vineyard, where they went on family bike rides, played golf, and most likely went to the beach. On Sunday, the FFOTUS returned to the country’s capital, still sporting their best island clothes. Malia, 17, who interned at HBO this summer and was spotted on the set of Girls, wore a chambray babydoll dress. She paired the easy breezy piece with cognac leather sandals. Her sister, Sasha, on the other hand, rocked a frock in a similar light blue shade with a large white flower pattern. The 14-year-old carried a white leather shopper, a black backpack, and wore leather lace-up sandel . Malia, Sasha, and Michelle Obama in Italy. If the sisters’ enviable outfits don’t serve as enough proof that they’re normal kids (only with odd perks, privileges, and restrictions), perhaps the fact that they share clothes will. The Tory Burch Embroidered Chambray Swim Cover Up Dress (#325) Sasha wore? Her sister Malia did so first. On a six-day cultural trip in June to England and Italy, the rising high school senior was spotted in Venice wearing the exact same thing. Did they fight about it? Probably. Because that’s what all sisters do.